Duchess Kate has seen her life take many unexpected turns. After school she became an arts student at St. Andrews University where she met William which would ultimately alter the course of her life in every respect for the rest of her life. After graduation she briefly worked as an accessories buyer for clothing chain Jigsaw, then took on many roles in the Middleton's family business Party Pieces including marketing officer, webpage designer and catalogue photographer. She remained in this position until her wedding. She is now the Duchess of Cambridge and our future Queen. If Kate had not met William one wonders what her vocation in life might have been? According to one analyst, Kate would have made the perfect teacher! 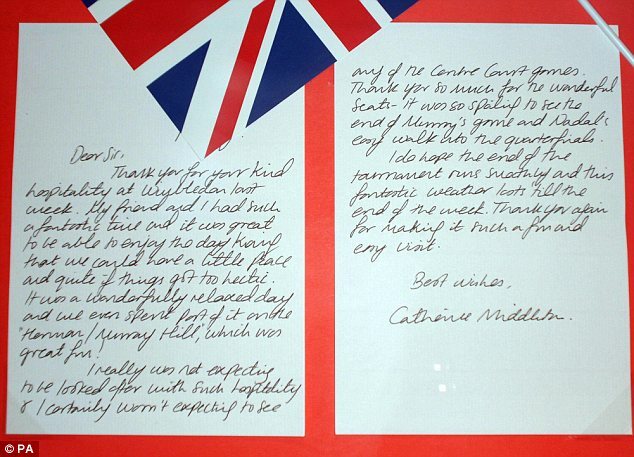 Former chairman of the British institute for Graphologist, Elaine Quigley studied a letter written by Kate (You will all recall the letter she wrote thanking Wimbledon chiefs for ensuring she had an enjoyable visit) Quigley said 'The flow of Kate's script with rightward slant and jointed letters, shows a writer who reaches out towards others. Looking at the letter, the endings of words are rather short, It shows her use of time is efficient. She doesn't prolong something that can be dealt with promptly. She clearly believes timekeeping should be taken seriously and, as a bit of a perfectionist, she will prefer to be ready early rather than rushing at the last minute. Judging by the characteristics of her writing Kate would have made a great teacher. She has the ability to explain things clearly and sensibly. One can also tell she really enjoys meeting people'. Duchess Kate certainly lived up to this character description during her tour of Canada, She was warm, friendly and down to earth. I can imagine her as a teacher being called 'Miss Middleton' as she interacts with children so well. What do you think? (Although, The Duchess of Cambridge suits her better :)) I expect her charitable interests may heavily involve children too! I, too, think she would've made a very fine teacher. It's so refreshing, watching her and her sweet husband touring around the world, embarking upon charitable events and the like. They certainly spread sunshine wherever they go, a fact so reminiscent of our lovely late Princess Diana. Whenever I see either her or William or both of them together in the news, I can't help but smile. I recall on the morning of the Royal wedding an american journalist said that one of the main reasons we are all fascinated with William and Kate is Diana. I do think this is true. Diana brought a sense of warmth and compassion that we have not seen before. Now William and Kate are carrying on that tradition.